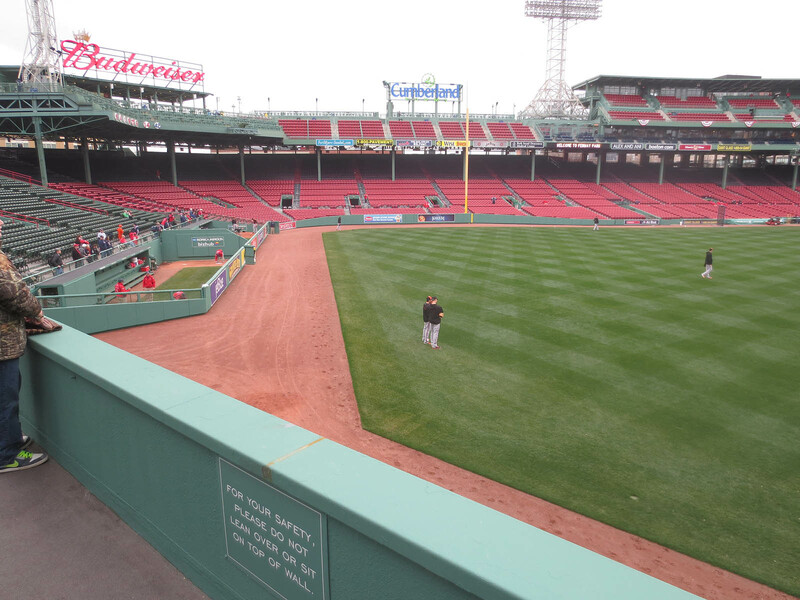 The last few years have been a struggle for me at Fenway Park. 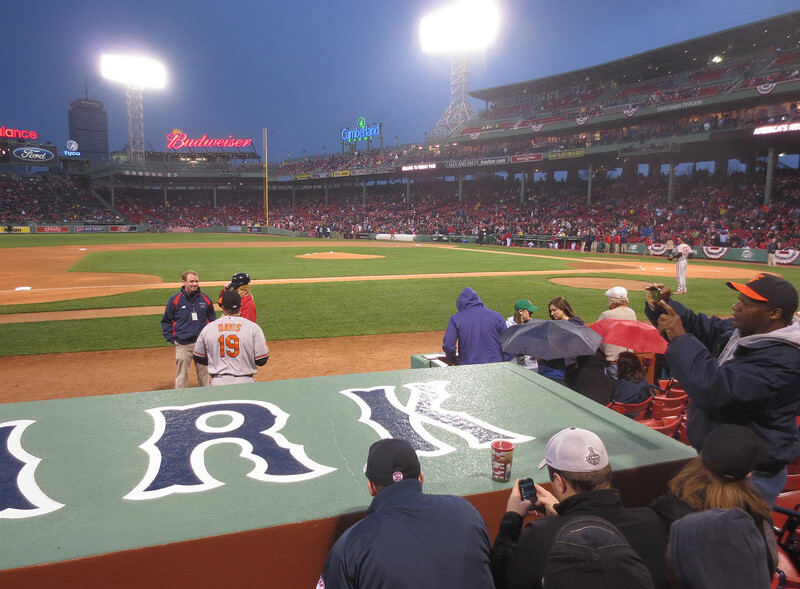 In 2011 I attended two games there on crutches, and last season, when I hired a videographer to get footage of my 6,000th ball, batting practice was wiped out by rain. The previous photo was taken by my friend Ben Weil. 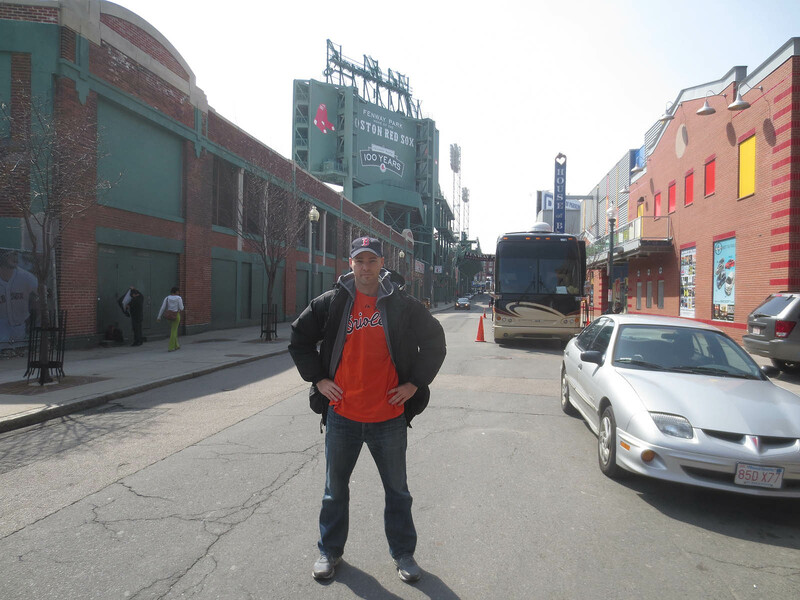 He and I drove up for the day from New York, courtesy of BIGS Sunflower Seeds — my official sponsor for the 2013 baseball season. Ben had to pay for his own ticket and food, but everything else was covered. All I had to do was try like hell to snag a game-used ball, and if I succeeded, it would mean an extra $500 for Pitch In For Baseball. 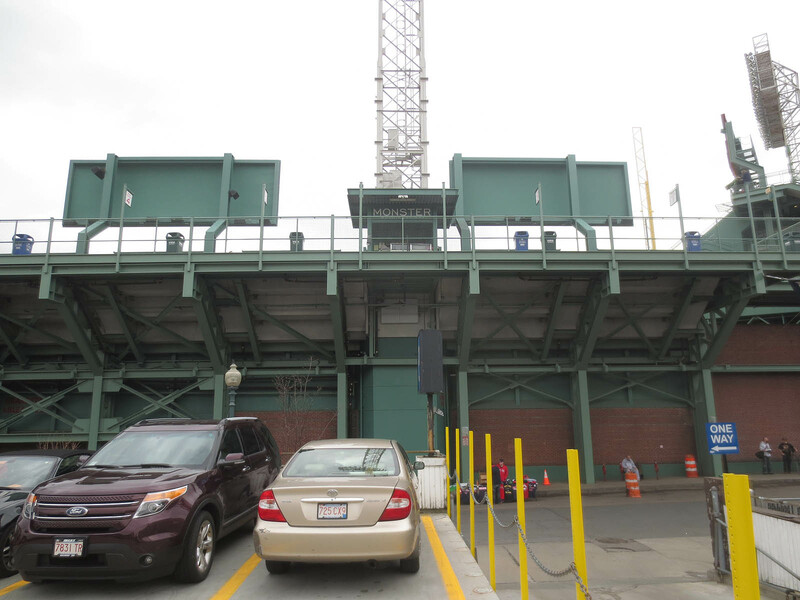 That’s the view from the open-air parking garage behind the Green Monster. Ben and I were hoping for a few longballs to find us, but there wasn’t any action. 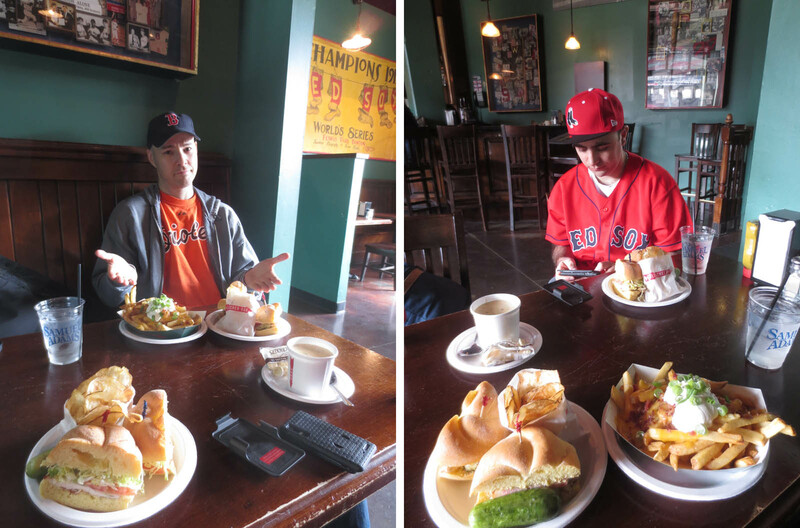 At around 3:45pm, we headed over to Gate C and met up with a couple of friends and Fenway regulars. Do you recognize them? 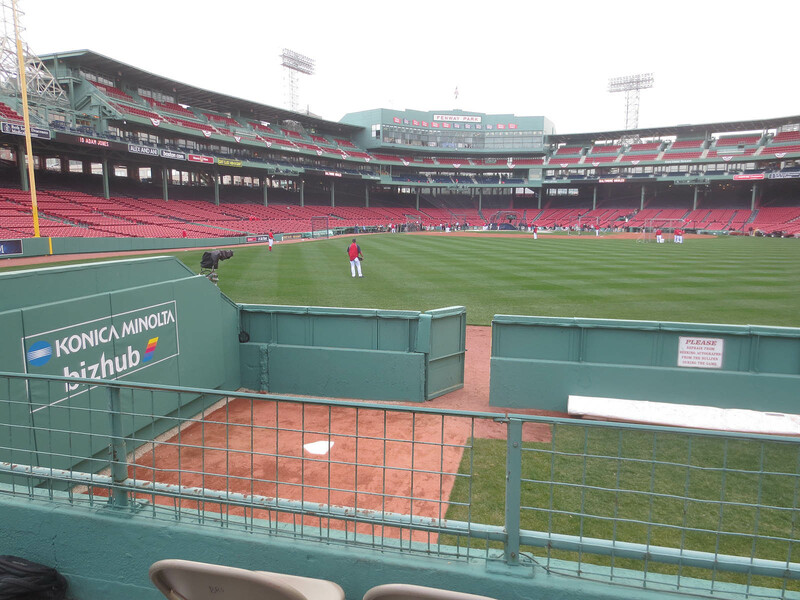 Halfway through the Red Sox’s portion of BP, I headed to right field. This was the view . . . I snagged it with my glove trick, marking the 400th consecutive game at which I’ve gotten at least two baseballs — a streak that dates back to the 2007 All-Star Game. 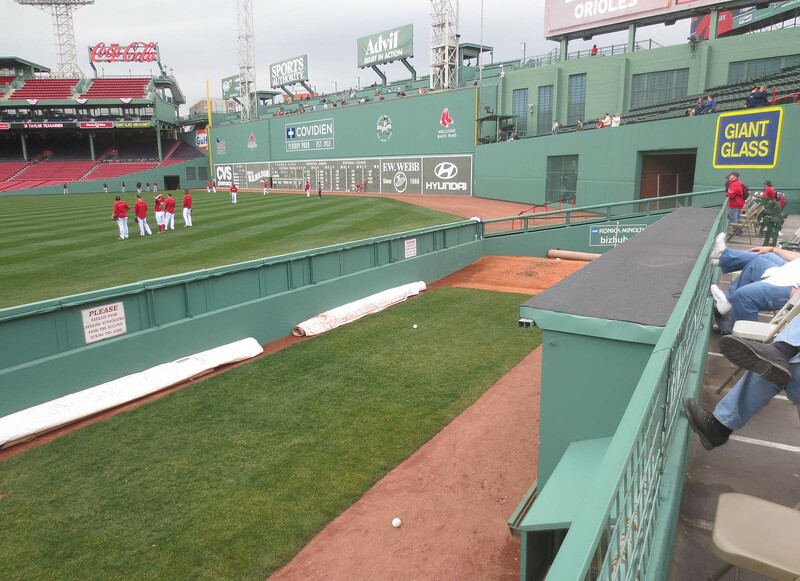 In the following photo, do you see the two baseballs in the bullpen? Then I headed back to center field, and just as the Sox were wrapping up BP, I got David Ross to throw me my 4th ball of the day. Soon after the Orioles came out, Chris Tillman recognized me and struck up a conversation. 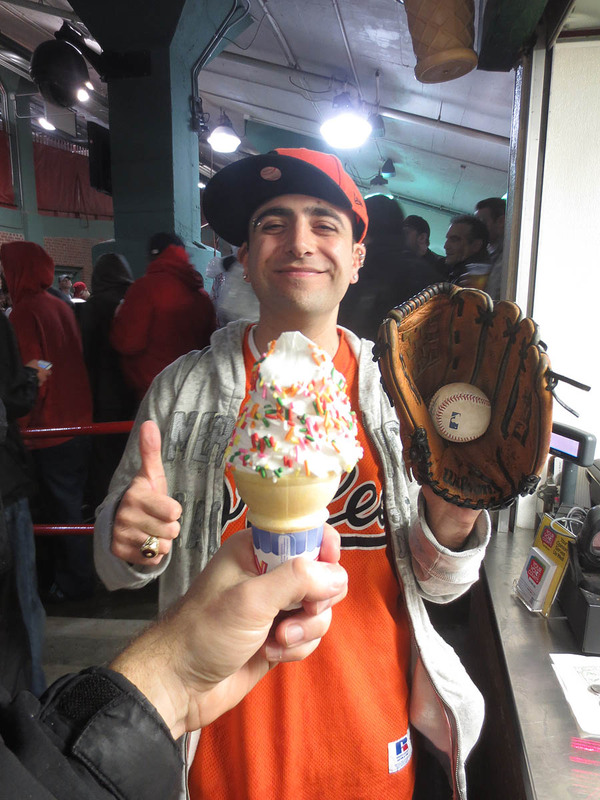 (We got to know each other a little bit at Camden Yards over the past few seasons.) 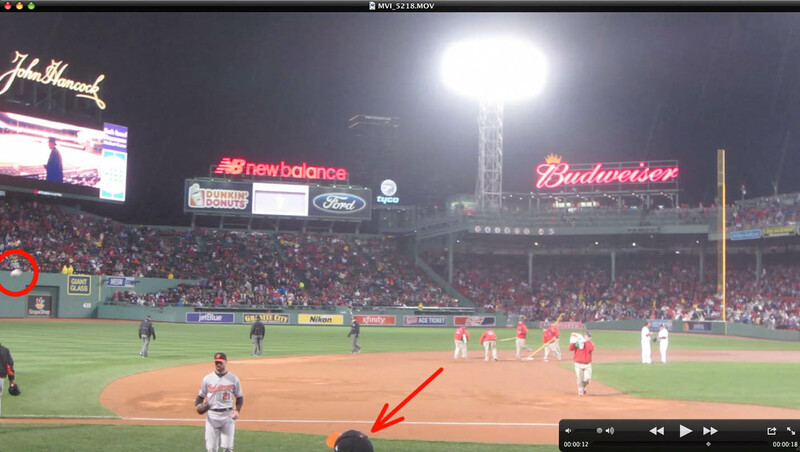 In the following photo, there are two players standing next to each other near the warning track. Tillman is on the right . 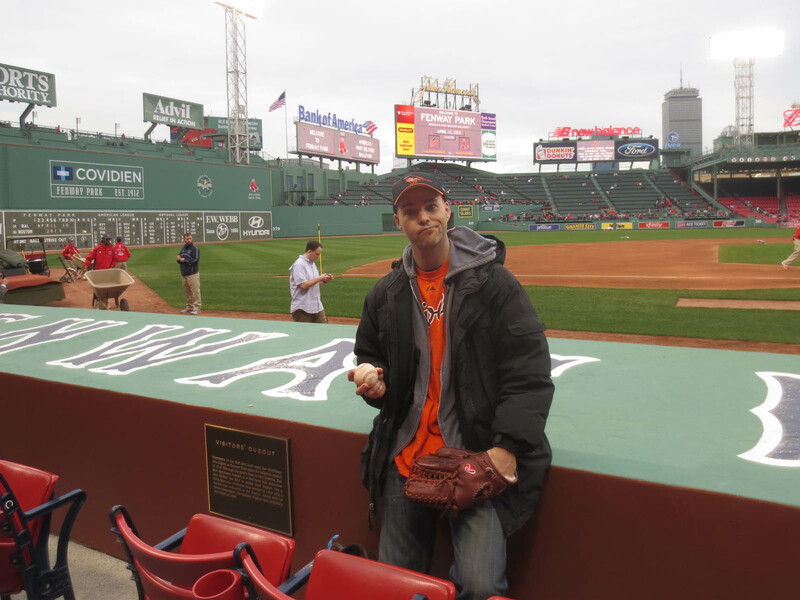 . .
1) I tweeted a photo of myself with four baseballs. 2) Jere’s finger was bleeding from a scrape he suffered while scrambling for a ball. 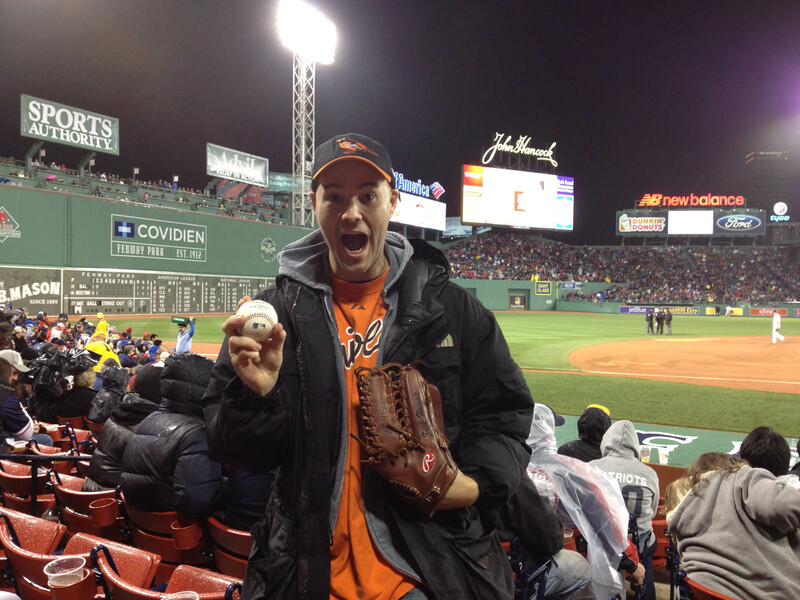 Then it started raining, and I headed to the Orioles’ dugout to try to get a warm-up ball. 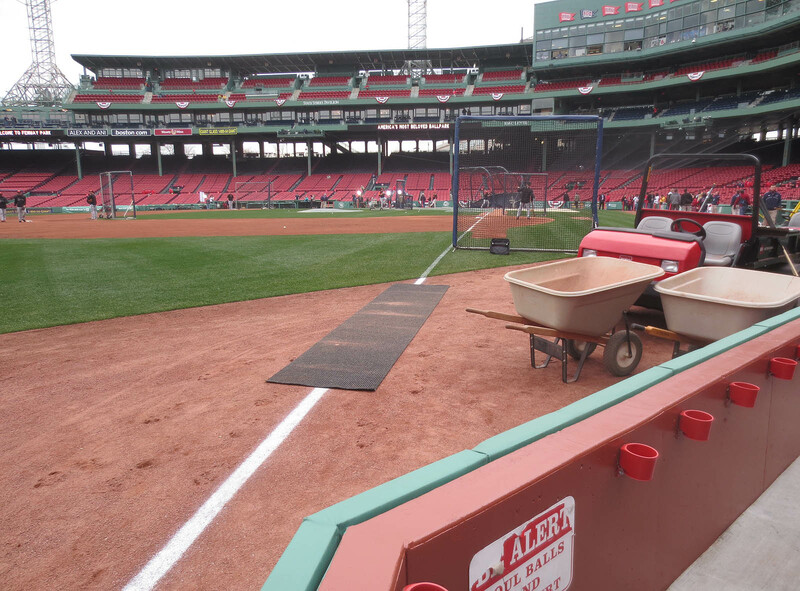 In the following photo, do you see the player standing near home plate? The video itself (filmed by Ben) isn’t worth sharing. I never intended to post it. I just wanted to be able to grab a few screen shots. I thought it’d be a great spot for a foul ball, but nothing came close. 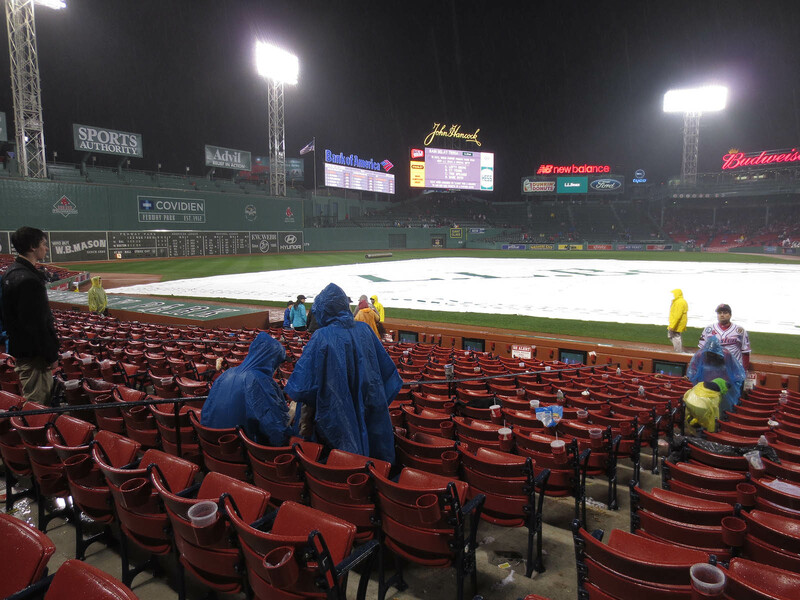 In the 5th inning, it started raining pretty hard . . .
Ben and I considered leaving — it was gonna be a long drive back to New York — but we ended up talking ourselves into staying. The way we saw it . . . if the delay didn’t last long, then there was no point in leaving, and if it DID last long, then everyone else would leave and we’d hate ourselves for not being there. In the last 24 hours, some media outlets have posted positive stories about the streak, while others have bashed its fraudulence. 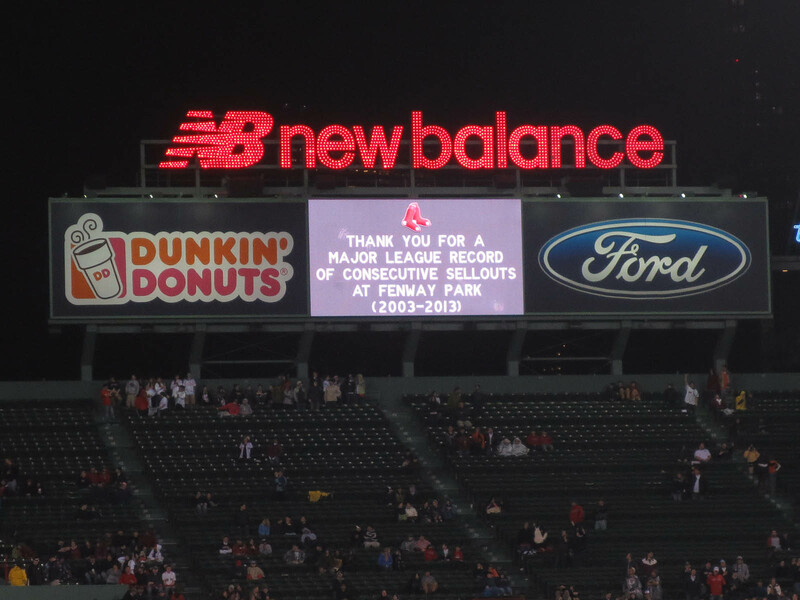 Either way you look at it, it’s still pretty cool that the Sox were THAT popular for THAT long, and I was glad to be there for the historic end. It was certainly easier to move around and find empty seats. 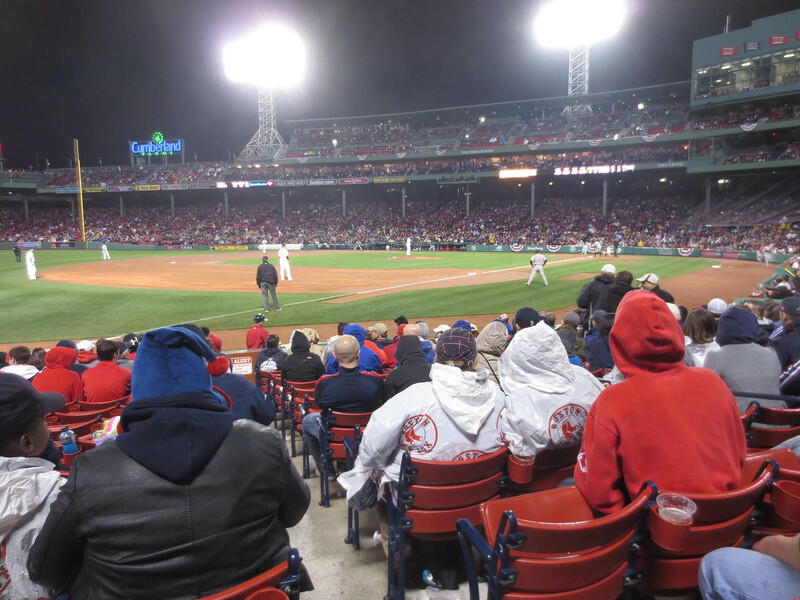 Hanrahan completely melted down — and it wasn’t my finest inning either. Chris Davis greeted him with a leadoff homer to center field, which I would’ve caught had I been camped out there in the cross-aisle, which is where I’d talked about sitting earlier in the evening. Then, after two quick outs, Hanrahan surrendered a single and two walks and uncorked a 55-footer to tie the game. 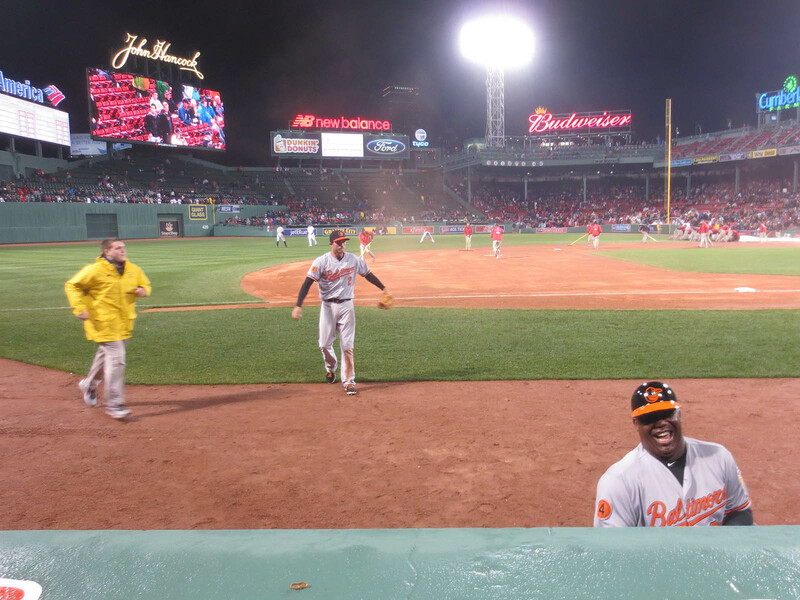 On the very next pitch, Manny Machado blasted a three-run homer over the Green Monster to put the Orioles on top, 8-5. That ball was thrown back onto the field, retrieved by 2nd base umpire Jim Wolf, tossed to Orioles 3rd base coach Bobby Dickerson, and then tossed to me in the front row behind the dugout. Sounds good, right? Well, I didn’t catch the ball. You know how an outfielder will sometimes dive headfirst for a sinking liner, and the ball will land a few inches short of his glove? Well, that’s sort of what happened to me. Dickerson’s throw was clearly going to fall short, but because there were huge/aggressive guys on either side of me (whom Ben had warned me about), I was forced to lunge forward and dive/flop for the ball atop the dugout roof. Unfortunately, the ball short-hopped my glove and hit the very tip of it and bounced back into the dugout. It was then tossed back up toward me, but fell so short that it didn’t even reach the roof. It was then tossed to a completely different section 20 feet away. At first I was bummed more than words can describe, but then it occurred to me: Would that ball have even counted?! One of the biggest rules in ballhawking, at least for me, is that I have to be the first fan to attain possession of the ball. (This rule is even listed here on the BIGS Baseball Adventure website.) 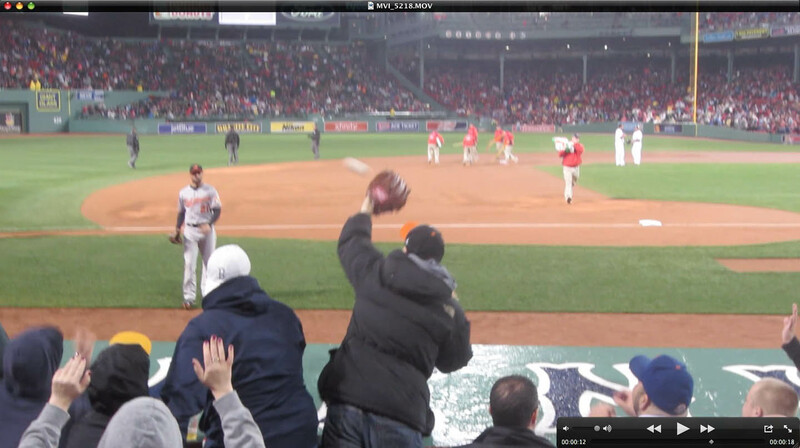 That home run ball WAS acquired by another fan when it first landed in the Monster seats, so if I’d caught it when the Orioles’ coach tossed it in my direction . . . then what? 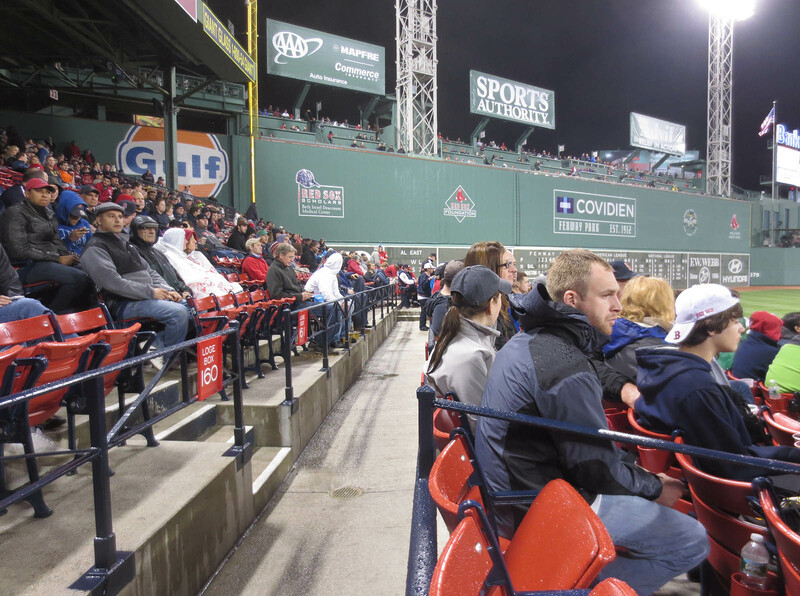 Should the rule be modified so that home run balls that get thrown back onto the field can be “re-snagged” when they re-enter the stands? If so, what would happen if a fan were to throw back a home run ball from deep in the bleachers, only to have the ball fall short and never make it *out* of the stands? Would that count for the person who re-snags it? This is murky, so in a weird way, I’m glad that I didn’t snag the ball. Everyone would’ve been divided. If I counted it, people would be calling me a fraud, and if I didn’t count it, that would’ve felt weird because it *was* the actual home run ball. Oy vey. I’d love to hear everyone’s thoughts on this. Anyway, the Orioles held on for an 8-5 win, and after the final out, I got my 9th and final ball from home plate umpire Cory Blaser. On my way out of the stadium, I gave away a ball to a young, exuberant fan named Kyle. Ben drove us back to New York. I was home by 3:15am and in bed at around 4:45am. Oof. 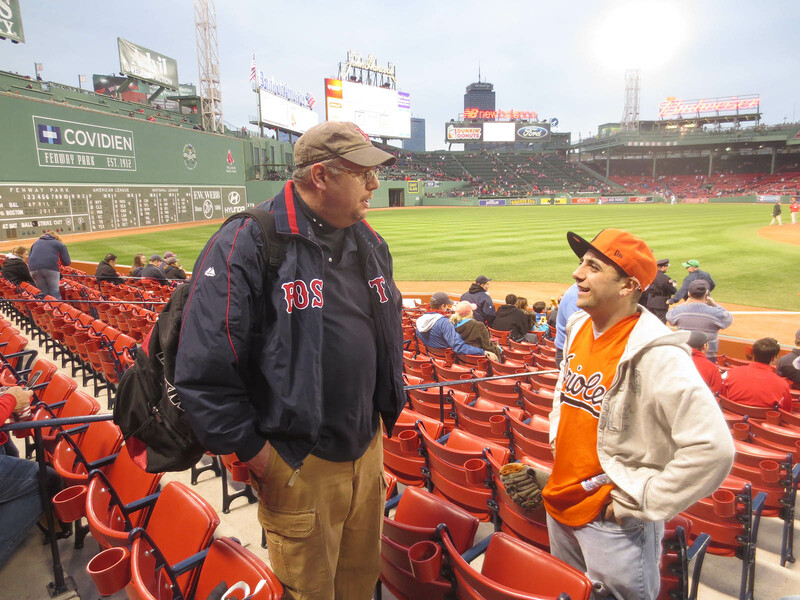 Next time I go to Boston, I need to spend a solid week at Fenway rather than doing this back-and-forth-in-a-day nonsense. • 20 balls in 3 games this season = 6.7 balls per game. 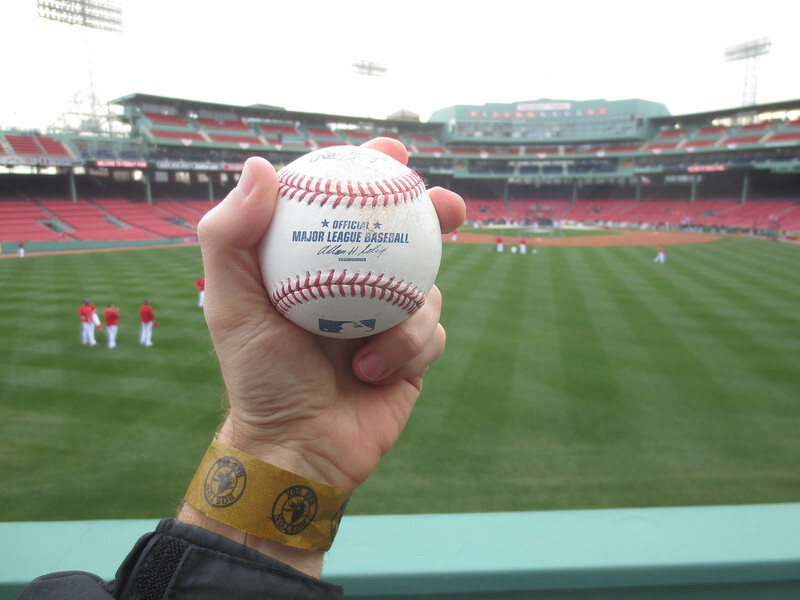 • 2 stadiums this season with a game-used ball: Citi Field and Fenway Park. You should include the $500/stadium in your charity stats. Would look way more impressive. If the ball had been tossed back by a fan, and nobody involved in the game touched it and somehow you snagged it, that ball shouldn’t count. However, an umpire AND a coach touched the ball, so according to your rules, since you would not have gotten the ball from a fan, but a coach, it should have counted (that is, if you had snagged it). That is a tough one. I think I would have counted it. Quite a conundrum though. 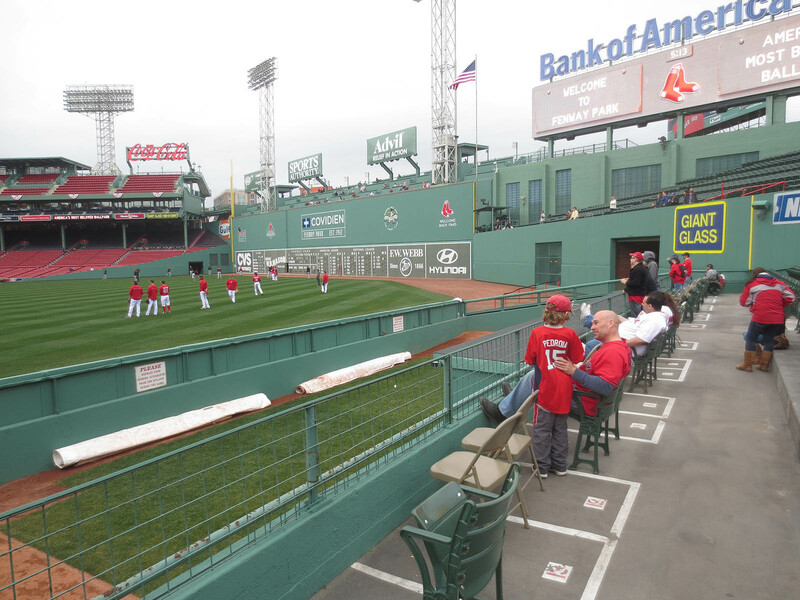 Cant wait to take a trip to Fenway this year. 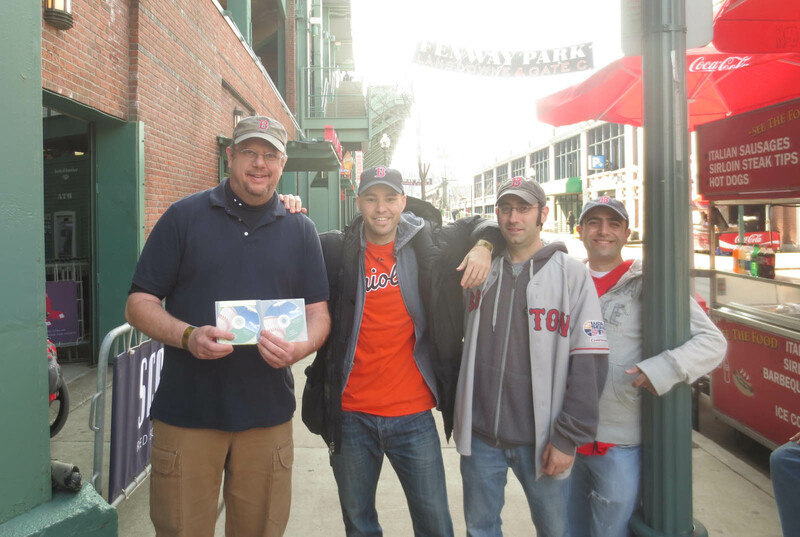 BTW saw someone on twitter tweet at the guy who runs the website, barstoolsports.com, about how many balls you got and meeting you last night. Sawadee Zack , how much are you being sponsored for a game home run ball caught by you ? 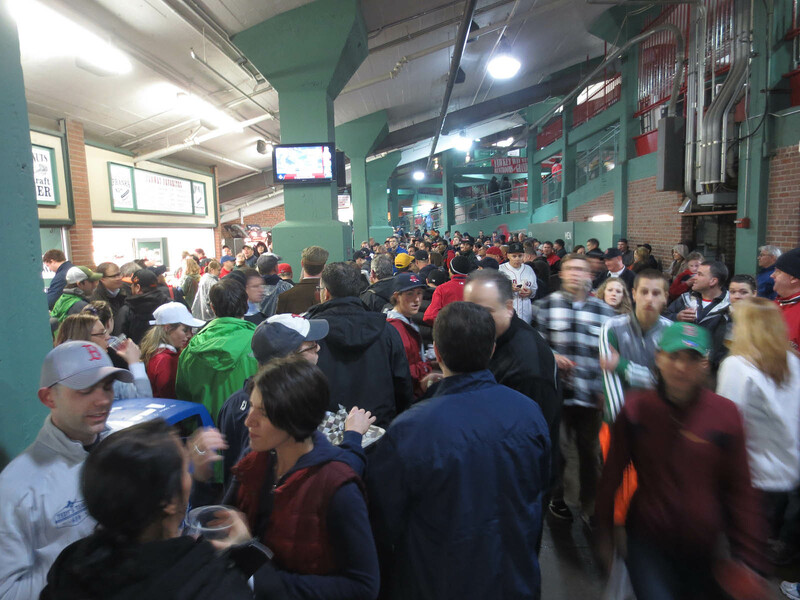 How are the ushers and security @ Fenway ? See you got to use the glove trick – what’s it like with the new mitt ? Zack, I would count it because it was thrown to you by a coach. i would not count it as a game ball because the fan might have done a switch-a-roo. I would for sure have counted it considering you put in all the effort into snagging it. 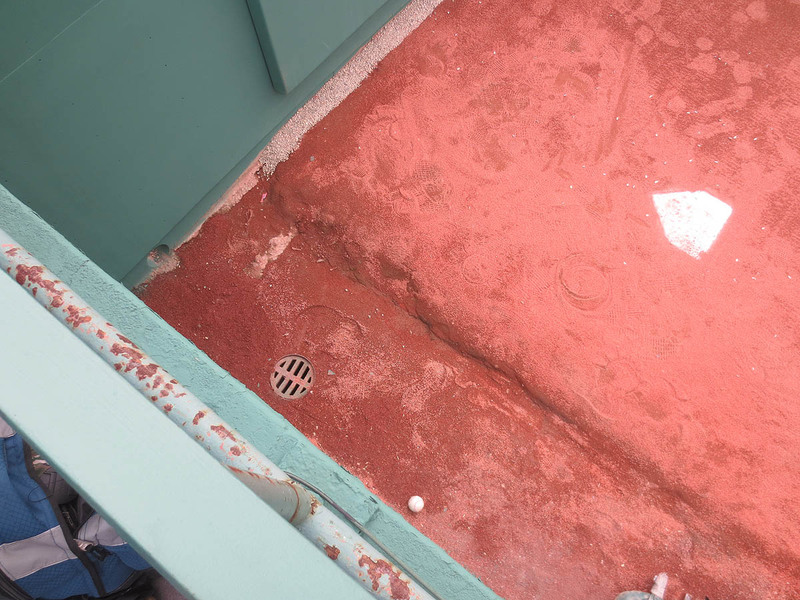 Think of all the balls in BP that are dropped back onto the field or even thrown back by fans (it happens). If a player were to throw it to you after a fan had touched it in a case like that, I’d bet you’d still count it. I would consider anything that either renters the field or is thrown again by a coach fair game. I wouldn’t count it. What if Ben brought a ball from his collection with him, dropped it on the field, and then a coach handed it to you? Would you count that? I doubt it. It’s essentially the same thing. It was in a fan’s possession, they threw/dropped it on the field, and a coach gave it to you. Who gets the most of the blame with the Dodger Padre brawl? What a great solution! I figured out how to view the videos — very cool stuff — but I’m not sure how to convert them. Hmm. Good call about the charity stats. I added it because of your suggestion. Thanks. As for whether or not to count the ball, it’s hard to argue with what you’re saying. But I will. It could be “scored” based on intention, like when a player bunts. If he’s bunting for a hit and gets thrown out (even with a runner on base), he’ll be 0-for-1, but if he’s bunting for a sacrifice, then he doesn’t get charged with an at-bat. You know? 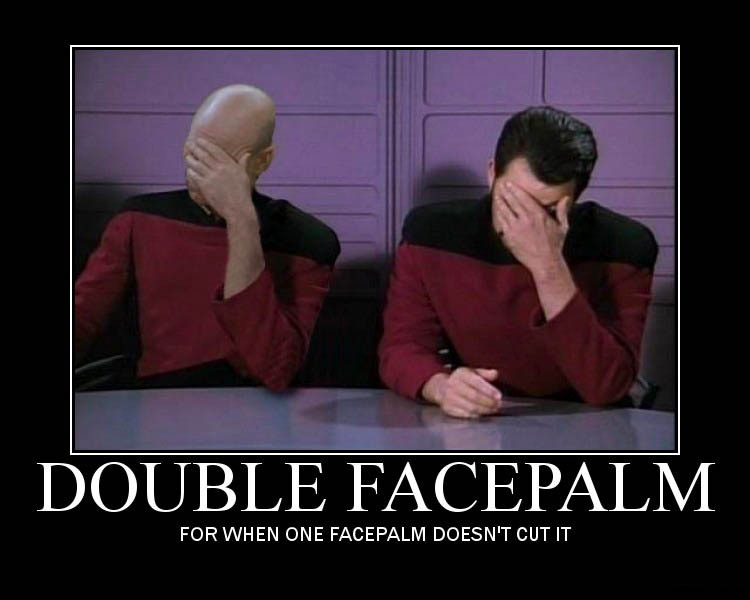 How about making rulings in the same way based on balls that get “returned” to the field by fans. If it’s an obvious set-up, then it wouldn’t count, but if a ball is thrown back with no sneaky intentions, then it’s all good? Acchh! Thanks for weighing in. Makes sense. And I think you’re right about the crowds. 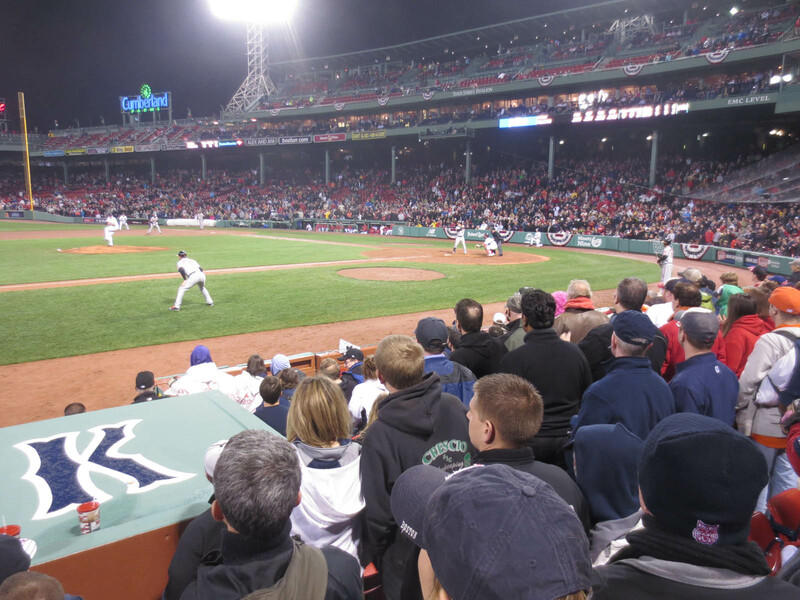 The third game of the season only had about 27,000 fans. Oh yeah? I never saw anything that was posted/tweeted. If you see a link, send it my way. 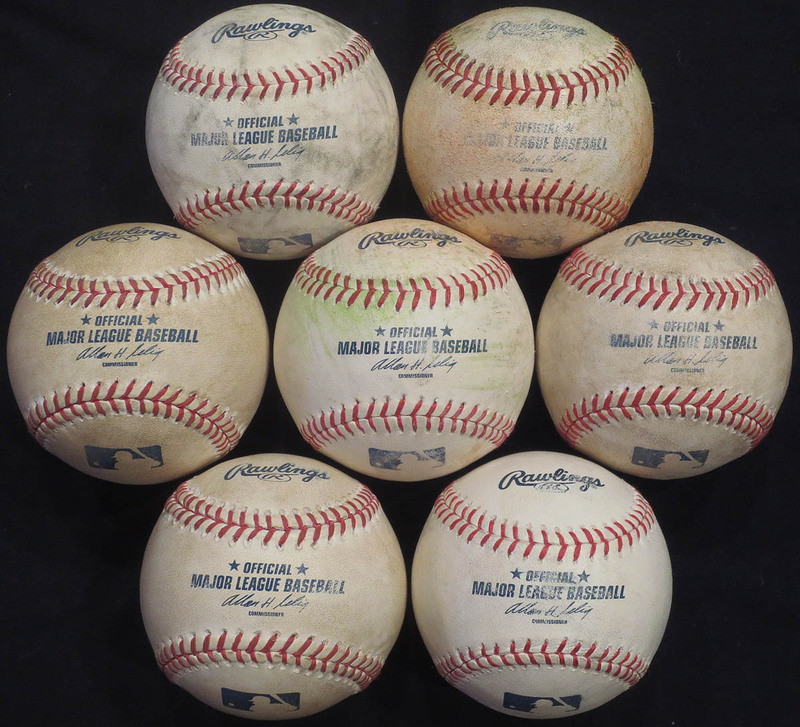 No extra money for 3rd-out balls versus game home runs, but that’s an interesting idea. I wonder if it would be possible for the folks at BIGS to toss in some bonuses/incentives. 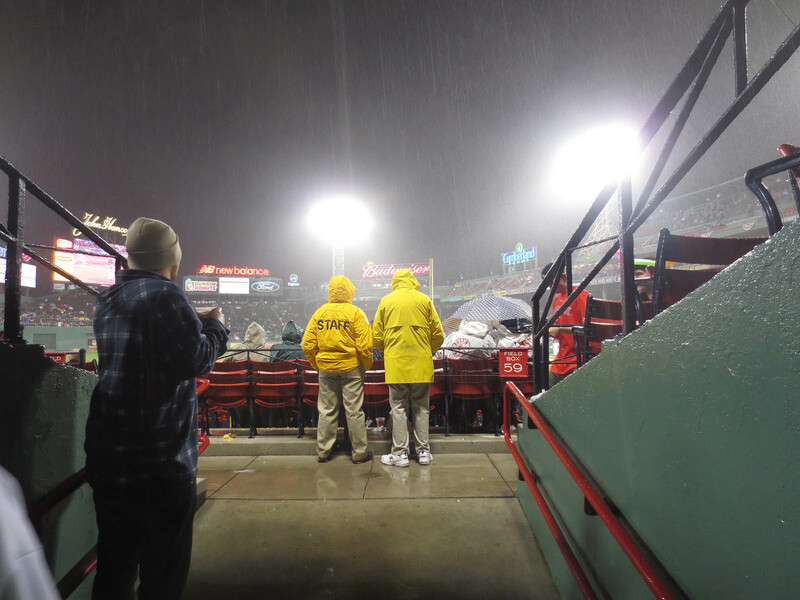 The ushers at Fenway are the best. They don’t care where you go or what you do, perhaps because they’re used to the place being packed — so where *would* people go, other than their assigned seats? At one point in this game, there were a couple of guys standing in the aisle, and a female guard walked by and said, “Grab a seat. 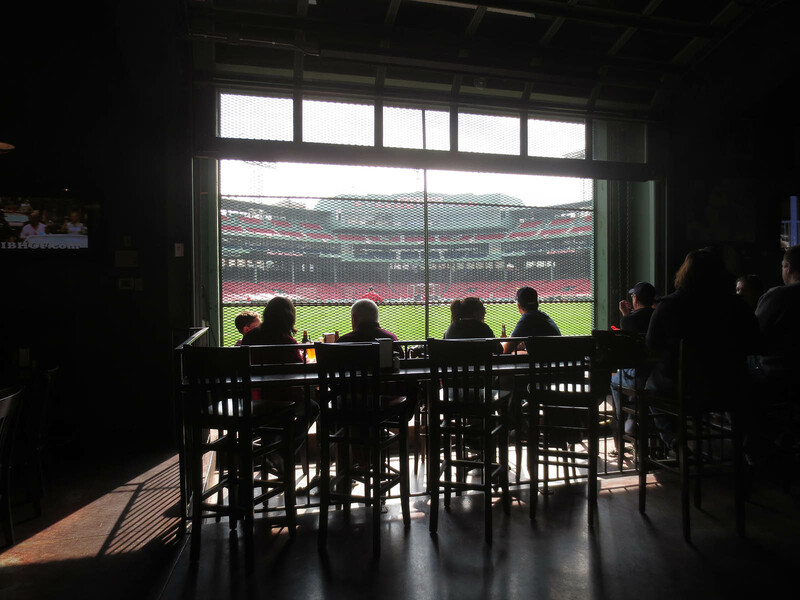 There are plenty open.” THAT is how it should be at every stadium. As for the glove trick, I have a new set-up. It takes a bit longer because I take the whole thing apart each time, but once I have it ready to go, it works better than the old one because my new glove is heavier, so it drops down better over the ball. (Basically, I got fed up with always having that wad of string in the palm of my glove, so I use a carabiner to get it on/off quickly. Good point about the switcheroo. Damn, this is really tough. I see your point, and it makes sense in theory, but balls don’t get thrown back onto the field during BP. Seriously, when does that ever happen? 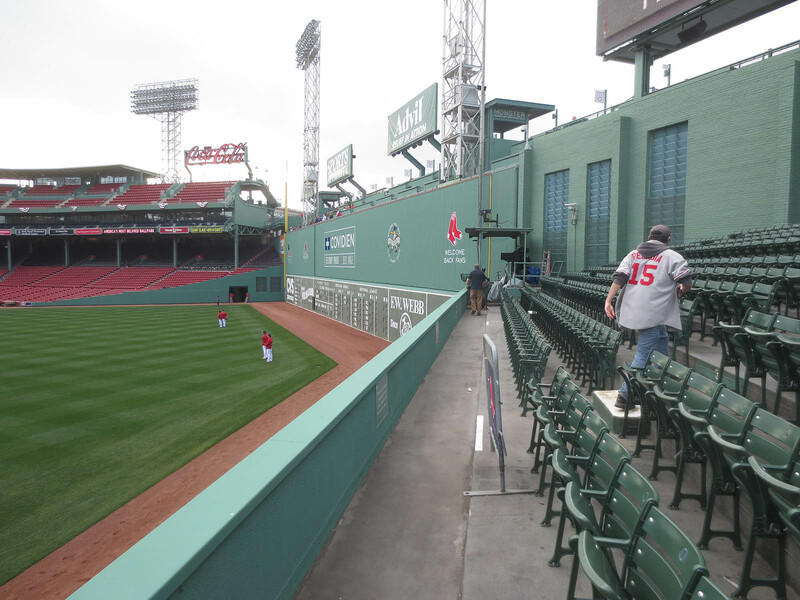 Any chance you’re coming to Fenway this year? There’s a chance, but not a great one. I’d need a special reason to go: commemorative balls, Watch With Zack game, going with a friend, etc. Ok just wondering. Was hoping to meet you at a Sox game. I’m going to one Friday. Good luck this year!